Far quieter than Taman Negara in Peninsular Malaysia, the Penang National Park is Malaysia's smallest and youngest national park. 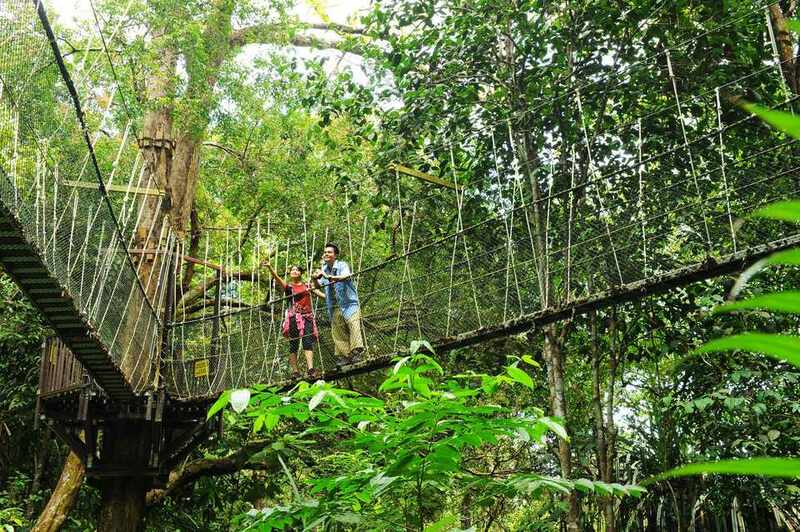 Known locally as Taman Negara Pulau Pinang, the Penang National Park occupies around ten square miles in the northwest corner of Penang Island. Eight of the best beaches in Penang are hidden away inside the Penang National Park. Nesting sea turtles, a meromictic lake with both saltwater and freshwater, undeveloped beaches, and mangroves await anyone willing to tackle the trails in the national park. For other nature reserves in the country, read our list of National Parks in Malaysia. The Penang National Park is one of the easiest parks to reach by public transportation. From George Town, you can take the Rapid Penang Bus 101 to Teluk Bahang to the west. The park entrance is only a short walk away from the bus stop. Once you get in (entrance is free), make the high-budget interpretation center at the entrance of the national park your first stop before going for a hike. The lavish facilities are brand new; the interactive and education displays have barely been touched by visitors. Binoculars and a spotting scope allow you to watch real life in the fishing village from a high vantage point. The Interpretation Center is open daily from 9 a.m. to 4 p.m. The three trails in the Penang National Park are steep yet well-maintained - the park facilities still feel new. A canopy walkway offers a glimpse of life in the trees and serves as a shortcut between the two main trails. Both main trails have enough leg-burning stairs to make even fit hikers sweat. All visitors are required to register at the information window before entering the Penang National Park. If you intend to use the canopy walkway trail, you must purchase a ticket at the window or you will be turned away! The information counter is open daily from 7:30 a.m. to 6 p.m. Unless camping, hikers are expected to sign out before 6 p.m. Entrance into the national park is free. Only 500 meters from the park entrance, you will be faced with a decision. Turn left to visit Pantai Kerachut - a beautiful beach where the sea turtles nest - or turn right to see Monkey Beach and Malaysia's second oldest lighthouse. It is possible to see the entire Penang National Park in one day with an early start and lots of energy! Monkey Beach: this stretch of beach is very appropriately named; macaque monkeys patrol the beach and roam the trails. Hiking to Monkey Beach takes a solid one hour and 15 minutes. Many other tourists reach this part of the park by ferry from the Teluk Bahang Jetty or from the resorts at Batu Ferringghi; despite its distance from civilization, Monkey Beach can get pretty crowded during tourist high season! Pantai Teluk Aling is a pleasant beach along the same trail approximately halfway to Monkey Beach. A local university maintains a turtle sanctuary in these parts. Muka Head Light House: If you have the energy, continue 30 minutes more past Monkey Beach to Malaysia's second-oldest lighthouse. A spiral staircase inside the lighthouse allows visitors to access the unbeatable views from the top. Canopy Walkway: The 20-minute canopy walkway trail serves as a shortcut between the two main trails. The walkway has a view of the river below and provides an opportunity for spotting birds. You must purchase your ticket for the walkway in advance at the entrance to the national park. The canopy walk is open from 10 a.m. to 1 p.m. and 2:30 p.m. to 4 p.m.; Closed on Fridays. Adults: $1.75; children: $1. Meromictic Lake: Only a handful of mixed saltwater and freshwater lakes exist in the world - the Penang National Park has one. Despite the claim, the meromictic lake is shallow, muddy, and generally not much to look at. Reach the lake by walking left toward Pantai Kerachut about 1.5 hours. Pantai Kerachut: Arguably the nicest beach in Penang, Pantai Kerachut is also a favorite nesting spot for endangered sea turtles. The deep, coarse sand is paradise after a sweaty hike; you may even have the beach all to yourself! Camping is the only way to see the turtles which come in at night. There are toilets, showers, and camping facilities at the far end of the beach as well as a small turtle sanctuary with baby sea turtles on display. Walking time: 90 minutes. Boats for the return trip: If your legs can't take anymore, boats can be chartered from both Monkey Beach ($17) and Pantai Kerachut ($33) to bring you back to the national park entrance. The small fishing town of Teluk Bahang is the gateway to the Penang National Park. A peaceful respite from Georgetown, Teluk Bahang is a place where life begins early and shuts down early. Food: A handful of Chinese restaurants, a Muslim-owned cafe, and assorted food stalls dotted along the main road offer a few Penang food favorites. A 24-hour minimart at the entrance of the national park has basic necessities. Water: Take advantage of the water refilling machine located in the strip of shops on the left side of the road as you approach Penang National Park; 10 cents scores you 1.5 liters of water and keeps one more plastic bottle out of the landfill! Money: The only ATM in town does not accept international cards - bring enough cash to survive. Read about money in Malaysia. There is no place to stay inside of the national park, however there are a few very basic accommodation options in Teluk Bahang. Many visitors to the Penang National Park are only daytrippers from Georgetown or nearby Batu Ferringhi. Camping is allowed with permission on Pantai Kerachut. Compare rates on accommodations in Teluk Bahang, Malaysia.